Today’s unhappy hipster post/caption made me laugh out loud. 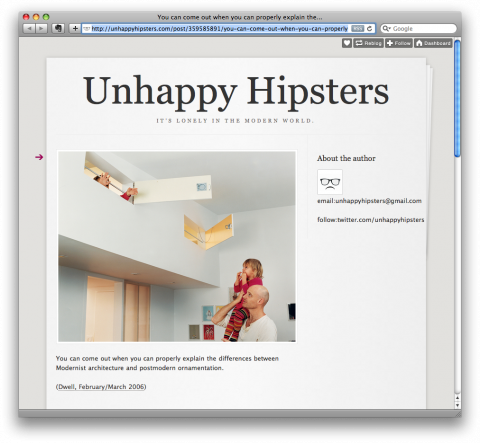 Unhappyhipster.com has been heavily mentioned on twitter over the past few days and I am dying to know who the brilliant copy writer is behind it all. I can simply *not* understand why the creator would stay anonymous. This ist is by far the most brilliant copywriter self-marketing tool I have come across in a long time. Dear unhappyhipster-copywriter-genius, reveal yourself and accept my hat tip! die anonymität hängt eventuell damit zusammen, dass der autor/die autorin keine rechte an den bildern hat, zu denen er/sie textet. manche fotografen/designer/architekten wären vielleicht nicht so humorvoll. When I read Unhappy Hipsters… it makes me wish I was much much more witty. Awesome. Betcha it’s an editor at Dwell. woooow. this is freakin’ genius and hilarious. regardless, someone at dwell / whoever it is deserves the hat tip!! the captions for these photos are priceless. Such an amazing blog! Who are those unhappy people featured in Dwell? Some form of Gruppie ( http://nymag.com/news/features/16529/ ) with money and a design degree?!!? Agreed! Too funny not to share whose brilliant idea came up with this!